Winchester (Shawnee: Eskippakithiki) is a city in and the county seat of Clark County, Kentucky, United States. The population was 18,368 at the 2010 census. 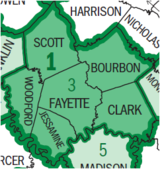 It is part of the Lexington-Fayette, KY Metropolitan Statistical Area. Winchester is located northwest of the center of Clark County, 18 miles (29 km) east of Lexington and 15 miles (24 km) west of Mt. Sterling. Kentucky Route 1958 (Bypass Road) is an outer loop around the town. Kentucky Route 627 (Boonesborough Road) leads towards Richmond, 21 miles (34 km) to the south. U.S. Route 60 (Winchester-Lexington Road/Lexington Avenue) runs through downtown Winchester. Interstate 64 passes through the northern part of the city, with access from exits 94 and 96. The Mountain Parkway turns off I-64 just northeast of Winchester and leads 75 miles (121 km) east to Salyersville. According to the United States Census Bureau, Winchester has a total area of 7.9 square miles (20.4 km2), of which 7.8 square miles (20.3 km2) is land and 0.04 square miles (0.1 km2), or 0.67%, is water. As of the census of 2000, there were 16,724 people, 6,907 households, and 4,620 families residing in the city. The population density was 2,187.6 per square mile (844.6 /km2). There were 7,400 housing units at an average density of 968.0 per square mile (373.7 /km2). The racial makeup of the city was 88.94% White, 8.83% African American, 0.22% Native American, 0.25% Asian, 0.01% Pacific Islander, 0.81% from other races, and 0.94% from two or more races. Hispanic or Latino of any race were 1.60% of the population. There were 6,907 households out of which 31.4% had children under the age of 18 living with them, 47.0% were married couples living together, 16.4% had a female householder with no husband present, and 33.1% were non-families. 28.5% of all households were made up of individuals and 12.6% had someone living alone who was 65 years of age or older. The average household size was 2.39 and the average family size was 2.93. In the city the population was spread out with 24.9% under the age of 18, 9.9% from 18 to 24, 30.0% from 25 to 44, 21.1% from 45 to 64, and 14.0% who were 65 years of age or older. The median age was 35 years. For every 100 females there were 88.7 males. For every 100 females age 18 and over, there were 84.4 males. The median income for a household in the city was $31,254, and the median income for a family was $36,797. Males had a median income of $31,295 versus $21,747 for females. The per capita income for the city was $15,611. About 13.1% of families and 15.5% of the population were below the poverty line, including 21.1% of those under age 18 and 14.4% of those age 65 or over. Winchester has been home to several higher education establishments. Kentucky Wesleyan College was located in the city from 1890 to 1954. When Kentucky Wesleyan left, the local Churches of Christ organized Southeastern Christian College on the former Kentucky Wesleyan campus. After SCC folded in the 1970s, the campus was preserved as a public park. Today, Clark County is home to the Winchester Campus of Bluegrass Community and Technical College. The city's only public high school, George Rogers Clark High School opened in the fall of 1963, consolidating the Clark County High School and Winchester High School, locally referred to as "County High" and "City High" respectively. The school has a strong record in athletics, celebrating state championships in numerous sports. The boy's basketball team (County) won the 1951 Kentucky High School Athletic Association (KHSAA) state title under head coach Letcher Norton. In 1991, the football team won the KHSAA Class AAAA state championship, while the girls' track and field team won the KHSAA Class AAA state title. In 1999, the boys' golf team finished as runner-up in the state tournament, and continues to make noise in the golf community, with several of its 1999 team members moving on to college golf and semi-pro golf. The boys' soccer team finished as runner-up in the state tournament in 2007. The most recent addition to GRC Athletics is the boys' and girls' swim team, which competed in its first season during the 2005-2006 school year. Daniel Boone, who established Fort Boonesborough on the Kentucky River. Boone is a respected figure in the town, with an annual "Pioneer Festival" held in his honor. Allen Tate (1899–1979), poet associated with the Agrarians, a group of Southern poets, and most noted for "Ode to the Confederate Dead"
The climate in this area is characterized by hot, humid summers and generally mild to cool winters. According to the Köppen Climate Classification system, Winchester has a humid subtropical climate, abbreviated "Cfa" on climate maps. ^ "About Us - Our History". Piqua Shawnee Tribe. 2011. http://piquashawnee.webs.com/aboutus.htm. Retrieved 2013-02-17. ^ a b "Geographic Identifiers: 2010 Demographic Profile Data (G001): Winchester city, Kentucky". U.S. Census Bureau, American Factfinder. http://factfinder2.census.gov/bkmk/table/1.0/en/DEC/10_DP/G001/1600000US2183676. Retrieved August 12, 2014. Wikisource has the text of The New Student's Reference Work article Winchester, Ky.. This page uses content from the English language Wikipedia. The original content was at Winchester, Kentucky. The list of authors can be seen in the page history. As with this Familypedia wiki, the content of Wikipedia is available under the Creative Commons License.